As Boots pharmacists prepare to vote on whether to recognise the PDA Union at Boots, the PDA Union has reviewed some of the statements that senior Boots spokespeople have made about their intentions for improving conditions for pharmacists without trade union involvement. 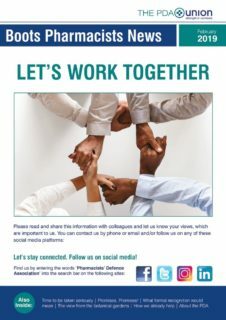 As Boots pharmacists prepare to vote on whether to recognise the PDA Union at Boots, the PDA Union has looked in to the files and found statements that senior Boots spokespeople have made about improving conditions for pharmacists during the 8 year period that they have worked against pharmacists securing recognition for the PDAU. But pharmacists are rightly questioning if these words ever actually make the promised improvements. The PDA Union document below allows Boots pharmacists to see for themselves a selection of the promises made so that they can compare what was said to the reality of their experience working for the company. You can find the sample of Boots promises and observations here. Please judge for yourself if these promises have been met.